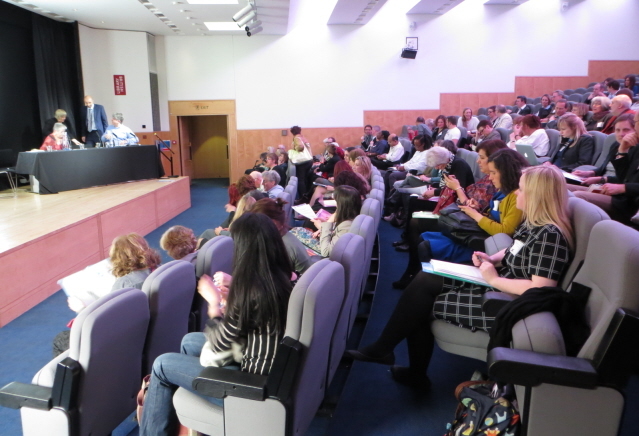 The Reader Organisation’s fourth national conference, Shared Reading for Healthy Communities, took place last month in London and we’re still enlivened and inspired by the day, full of insightful evidence and wonderful stories about the power of shared reading. For those of you who couldn’t join us or for those who simply want a refresher of what happened on the day, The Reader Online is bringing you a series of highlights from the conference over the next few weeks here on the blog. I joined Book Break at a time when I was at my lowest ebb. I had been ill for a couple of years and coupled with other problems I had not bounced back. I had withdrawn completely from society and had given up the many activities that I used to love. This particular morning I had just come out of my doctor’s surgery and outside the library, which was a couple of doors down, was a lady handing out leaflets and telling passers-by about Book Break sessions that were starting in a couple of weeks’ time. I stopped to hear about the sessions and as we talked I started to feel uplifted for the first time in a very long while. Additionally, I had been undergoing ongoing surgery on one of my eyes, which left me not being able to see properly or read for lengthy amounts of time, so even reading a newspaper was difficult and I had not picked up a book in ages. That day will be etched on my mind forever, as it was the start on the road to recovery and getting back to living. Two weeks later I went along to Book Break and that was 4 years ago. Book Break helped me to venture out again. I have rebuilt my life, have many pastimes and enjoy community involvement. It is unique because of its appeal to all ages, people from all walks of life, people with difficulties or problems and just people who want a dedicated time for reading, with no interruptions. It calms the anxious mind; it is an escape from everyday pressures; it is a sounding board for those with English as a second language; it is company, and I have seen the benefits that it has given so many people. In our group we not only talk about the book; we often can relate to parts that match incidents in our lives or places that we have been too and our discussions take on new meaning. We research different things related to the poem or book and people bring in information to discuss the next week. For instance, we are currently reading Jamaica Inn and the story line left us wondering about law and order at the time when the book was set and information on this was found for us all to share. I think I have most liked reading Spies by Michael Frayn. I did not really want to read this at the beginning; I hate anything to do with spies, the Cold War, etc. as I never understand them. When we read this, we were all sitting on the edge of our seats and could not wait for the next week to come; we all had theories and we were all wrong! A brilliant book. This week (17th-22nd June) is London Creativity and Wellbeing Week, and we run shared reading groups in Barnet, Kensington and Chelsea, Tower Hamlets, Lambeth, Southwark, Haringey and Westminster each week which offer Londoners the chance to relax, rejuvenate and boost their wellbeing through reading and discussing books together. To learn more about our work in London and see a full list of open groups, visit the Where We Work and Reading With Us sections of our website.